Irish troops in Syria return fire after being hit by "unknown blast"
An estimated 36 Irish troops were on patrol when their convoy was hit but none sustained any serious injuries. IRISH TROOPS ON United Nations peacekeeping duty in Syria’s Golan Heights were hit by an unknown blast this morning. The convoy of about 36 Irish troops travelling in five MOWAG armoured vehicles returned fire before leaving the area and returning to their base. 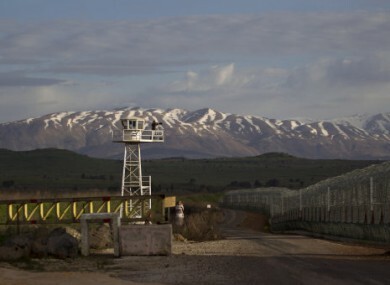 The incident occurred between 9am and 10am local time in the village of Ruihinah which is in the area of separation between Israel and Syria in the Golan Heights. No Irish troops sustained any serious injuries during the incident. One soldier sustained minor soft tissue damage whilst adopting a defensive position inside a vehicle but it is not of any concern and the soldier is due back on duty tomorrow. One of the vehicles suffered tyre damage as a result of the blast but the convoy were able to quickly remove themselves from the area. The source of the attack is so far unknown with an investigation likely to be carried out. Email “Irish troops in Syria return fire after being hit by "unknown blast"”. Feedback on “Irish troops in Syria return fire after being hit by "unknown blast"”.